So why do we need to pay attention? Because these corrupt or un-processable elements can cause major file slow down or crashes! More than that, its annoying to have these messages come up every time the 3d window is refreshed. And now the solution, how do we fix a file with an error report? It is usually very simple. If the error report comes up in the 3D window, open the 3D window, review the Report window, and scroll to the bottom. The report is a list of everything that has been (or is not able to) be processed in a given view. It will typically show problematic elements last, so they will be at the end of the list. In the image above, I loaded a handful of objects with known problems and placed them in the model to force the report. 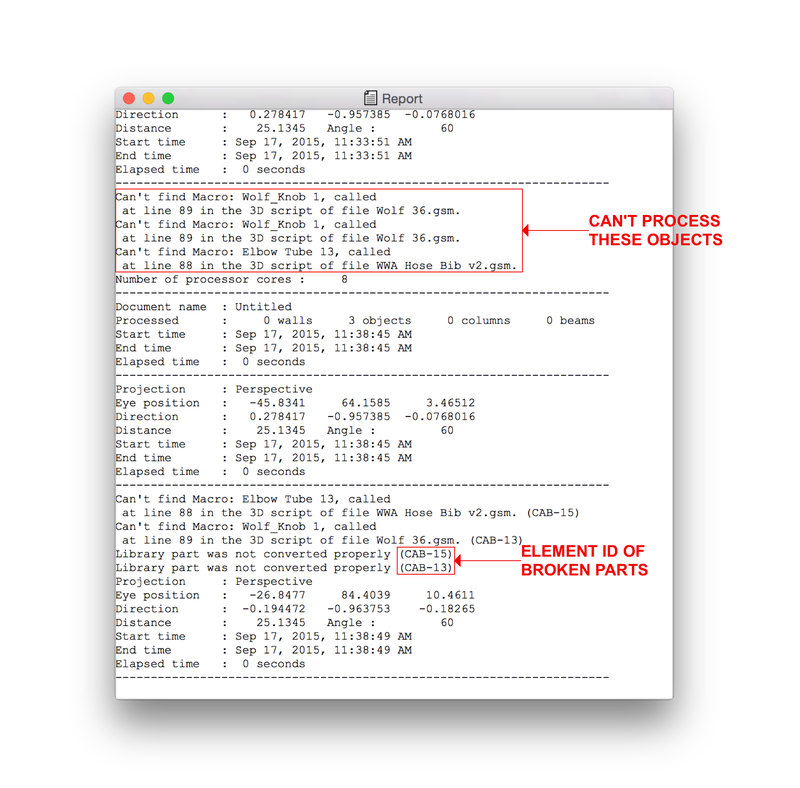 The first outlined section shows the object names that can not be fully processed. The next section shows the library part with Element ID CAB-15 & CAB-13. If the element causing problems is not a library part, the report will not give the first outlines section, but will report the element ID of problematic elements. To fix this file you only need to do a find and select for the element or objects name or element ID. If the error states that the object “Can’t find Macro:” the solution is to replace it with a good object. If it states that a polygon is degenerated the slab or roof just needs to be inspected for bad or odd geometries (look for groups of nodes that shouldn’t be there). If the report states that a fill is missing, do a find & select for the element ID or Name and replace the missing attribute. After this you should be able to refresh the view without the error report resulting. This entry was posted in Element ID's, Libraries and tagged Error Messages on September 17, 2015 by wwabim.